Solid-State Light Assemblies (SSLAs) are replacing old lighting technology aboard the International Space Station. These lights offer more efficient, longer-lasting lighting options, as well as provide crewmembers with the ability to adjust lighting intensity based on the time of day, promoting a more conducive environment for both sleep and alertness. Astronauts on the International Space Station are swapping out their fluorescent light bulbs for a fancy new set of light-emitting diodes (LEDs) that scientists think will help them sleep better and be more alert. If the new lights work as intended, the technology could help people on Earth sleep better as well. The intensity and colors of the light emitted by the new Solid-State Light Assemblies (SSLAs) can produce millions of different spectra of light. Three settings will help to create a lighting environment that can either increase alertness, promote sleepiness or provide normal "daylight" that will help astronauts see clearly during normal work hours. In fact, research has shown that astronauts don't get enough sleep. On average, they sleep about 6 hours per night, while their schedules allot 8.5 hours. As a result, sleeping pills and caffeine are popular commodities among space travelers. On Earth, the human body naturally operates on a 24-hour schedule called a circadian rhythm. Our biological clocks depend on a regular pattern of sunlight and darkness to keep that rhythm going. In space, astronauts depend on artificial lighting to regulate their sleep-wake schedules. But it's not just the timing of the light that matters on the space station — the type of lights used can make a big difference when it comes to keeping sleep schedules on track. Fluorescent light bulbs and LEDs are prized for being energy-efficient, but the light they produce can contribute to insomnia. Both emit blue light, which promotes alertness while decreasing the amount of the natural sleep hormone melatonin. While blue light may be helpful in the mornings, exposure to blue light closer to bedtime can make falling asleep more difficult. 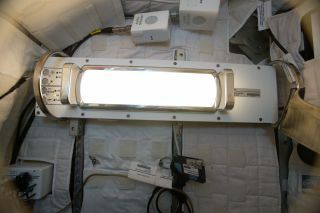 The new SSLAs that are being installed inside the space station contain LEDs, but with the adjustable light spectrum, blue light at night will no longer pose a problem. Before bedtime, the new lighting system will emit a spectrum of light without the smaller wavelengths of blue and violet light. When it's time to wake up again, the light spectrum will include that element of the spectrum to promote alertness. This can help astronauts reset or maintain a healthy circadian rhythm and, in turn, make them more productive on the job. Expedition 18 Commander, Mike Fincke, holding an early version of a solid state lighting assembly (the general luminaire assembly or GLA) that is part of the Lighting Effects investigation. Equipment for that investigation will fly toward the space station aboard a Cygnus spacecraft on Oct. 14, 2016. Astronauts began replacing the old fluorescent General Luminaire Assemblies in August, and the transition is still ongoing. Meanwhile, NASA has been studying how the new lights are affecting the astronauts through the Lighting Effects Study. "The system can provide millions of different light spectra," Steven Lockley, a sleep specialist at Brigham and Women's Hospital and co-investigator for the Lighting Effects Study, said in a statement. "We’re not making the ISS into a disco, but we are going to use three different light settings. We'll use a general light setting that provides a good light to see by during normal work, a higher-intensity blue light enriched setting that elevates alertness and can better shift the circadian clock when needed, and a lower-intensity blue wavelength-depleted 'pre-sleep' setting to calm the brain and promote sleep." Results from the sleep study will help flight planners optimize lighting schedules for astronauts during spaceflight, but it can also help people on Earth gain control of their sleeping patterns. "Study results should make it clear exactly when and how to use these various settings of light intensity and spectrum," NASA officials said in the statement. "These results could also lead to Earth-based benefits such as helping manage sleep patterns for shift workers, or even developing treatments for sleep disorders or jet lag."